The extraordinary natural environment of the Baja California peninsula with its ocher semi-desert landscape contrasting with the deep blue Sea of ​​Cortez is the ideal context and chosen to erect a new hotel landmark in the area and the country. The Hotel Solaz in process of developing over an area of ​​9.5 hectares with some unique landforms that integrate harmoniously . The guiding architectural concept was the correct integration of the building and was achieved through organic forms that refer to the movement of the waves that make an aesthetic volume and that adapts to the environment. The selection of materials, vegetation and construction methods reinforce this concept of integration to be thoroughly studied to be consistent with this heavenly spot. This development services extend to provide more accommodation and lodging options for national and international visitors; being a development that integrates a hotel with 131 rooms, 147 timeshare villas, 21 managed by the Hotel, 18 beach club condos, restaurants, spa, amenities, etc. From the natural topography of the land that grows in ascending northward from sea level, it was decided to form three curved terraces from east to west harboring hotel rooms on the west side and timeshare on the east side . The flow through these terraces are presented as “ravines” that also serve as dividing corridors with dense vegetation between the two applications achieving greater privacy. 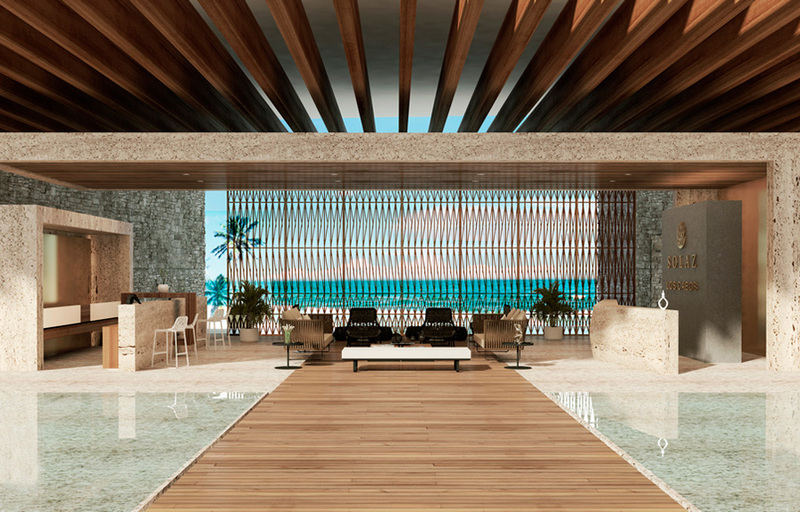 Solace Luxury Collection Hotel, Los Cabos will be a brand new property located on the spectacular beach of one of the most coveted destinations in Mexico. It will have modern and pristine accommodations and stunning beachfront facilities. You will also have world-class dining options, several restaurants and bars for formal and informal meals. A spa and fitness center of 1,160 square meters will offer specialized services and treatments, and guests have access to a cutting edge exercise equipment, and three tennis courts. The hotel, ideal for meetings and events, will have 920 square meters of meeting space, including four ballrooms and parties.